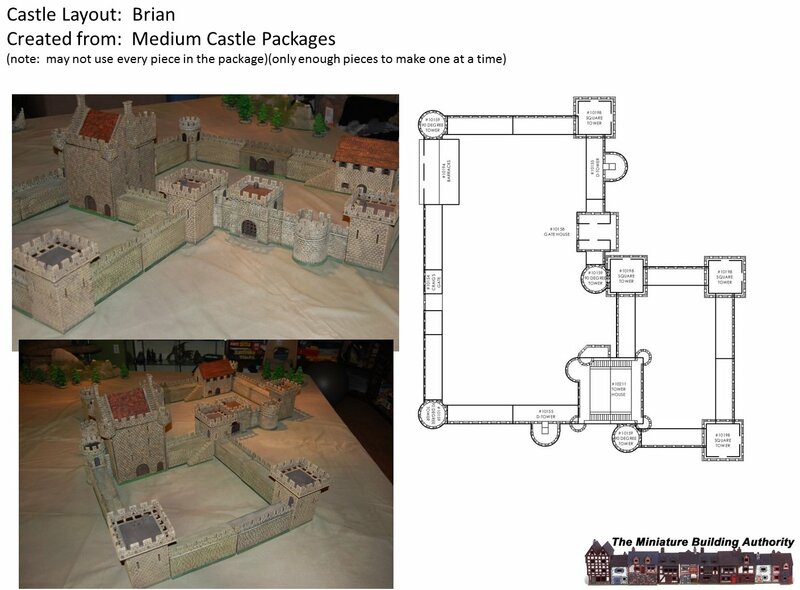 Created from Large Castle Package. 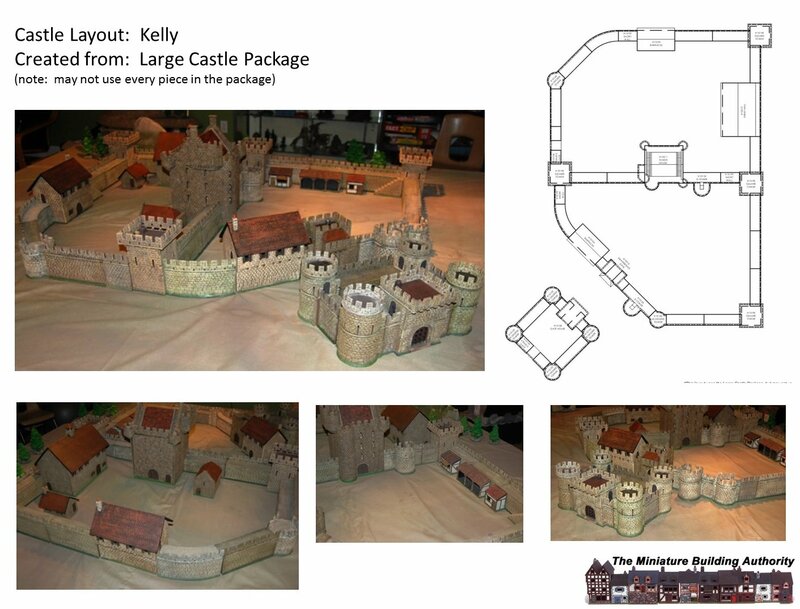 Categories: Designer Notes, Kick Starter, New Products, News | Tags: castle, castle layout, kickstarter, layouts | Permalink. MBA is now working with a great terrain painter, Denise Haynes. She is extremely talented and is working with us to provide you cool new custom painted Direct Terrain and MBA items for your collections. Each item is a unique custom painted item that has limited quantities. The Stone Cottage, Large Shanty and Small Shanty are all painted and ready to go. Be the first in your gaming group to check these out. Again there are limited quantities so don’t delay. Next year we will have even more products available as well. 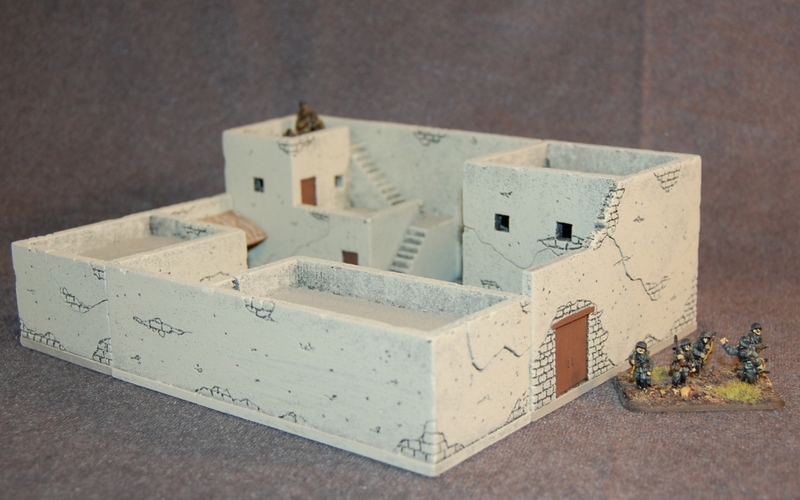 View Customs by Denise painted buildings on our website. Categories: Designer Notes, New Products, News | Tags: custom painting, customs by denise, terrain painting | Permalink. Many customers have had an interest in our building signs that we produce. I have asked Jim to paint up a set of them and now we are adding them to two of our buildings. Step 4: Carefully drill your hole. The hole should be the same size as the post on the sign. Step 5: Insert the sign and make sure it is where you want it to go. At this point you can glue the sign in place, or leave it so you can swap the signs out for different scenarios or adventures. Categories: Designer Notes | Tags: adding signs, building signs, how-to, signs | Permalink. A very productive week. The new bandsaw and planer are operational and I used them to prepare the foam for modelmaking. (For more on this, see “How it’s done”) Then it was right to work with the prototype for a building that will make a nice addition to the 28mm Eurovillage WWII buildings (Café, Patisseri, Corner Shop and Ruined Shop). This is a two story house from Carentan and could be added to a row the other buildings or be used as a stand alone farmhouse. No name for this one yet, maybe Carentan House? She is all done, painted and off my bench. Pictures will appear when I have the camera. Still painting figs for Desert Breeze as well. This week it was sheep and Iraqi Police as well as some more civilians. Still looking for more 28mm insurgents. Next up: an addition to the growing 28mm Dark Age village. This will be a Mead Hall, based on a re-creation at Wychurst in Kent, England. Yes, it will be very cool. With the summer convention travels finished, it is time for me to work on prototypes of products that should be released over the next year or so. I often work on an idea when the energy seems right, whether that schedule matches our release timeline or not. So please understand that we have not yet decided when, or even if, these prototypes will become products. Today I will be finishing and painting a new Ruined Townhouse D. This will be the companion piece for Ruined Townhouse C (10195), much as the older Ruined Brick Corner Townhouse (10112) and Ruined Tudor Townhouse (10113) served so well. Those earlier pieces have sold very well, but the time has come to replace them with new variations rather than order another production run. The other major task on my bench the past few weeks is painting scores of figures. 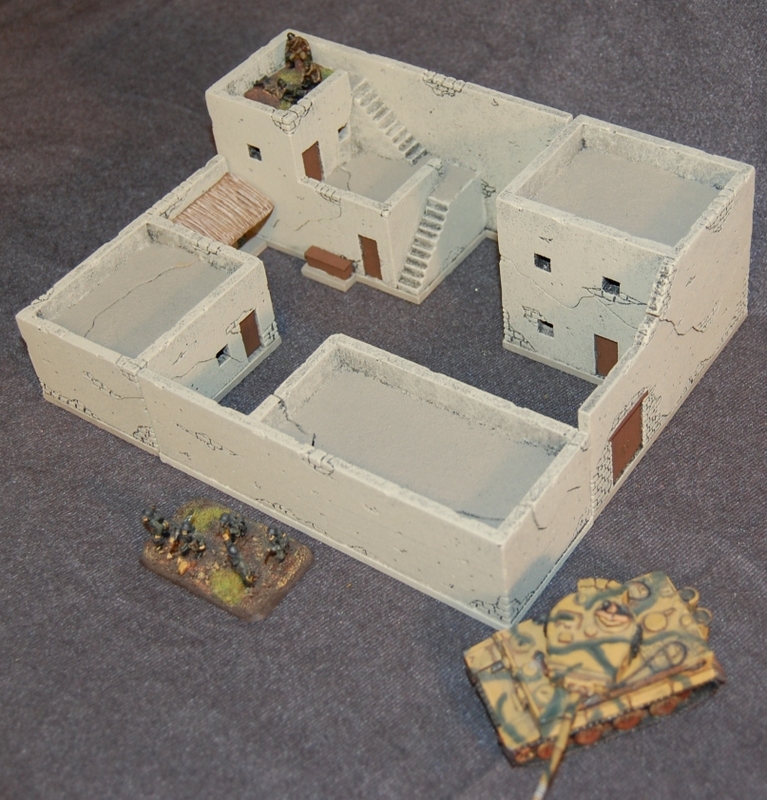 As some of you know, MBA runs a very large 28mm modern Middle Eastern game at Historicon and other conventions. Sometime over the past year, most of the figures we use for this game went missing. This included 50+ Taliban figs, 50+ Insurgents, Iraqi Police and Army, 50+ civilians, scores of animals and dozens of other figs. We have been able to purchase replacements for most (requiring many hours of my painting time) but we could use some help with sourcing a few. We have a shortage of modern Insurgent figures. Empress Miniatures and Stan Johansen Miniatures have some, but we are still woefully short. We did have some TAG figs, but there is no ready source available right now. If anyone knows a source for Insurgent figs, please let us know. Tommorrow I will pick up the new bandsaw I need to prepare the foam used in making the prototype models. And it is time to buy some more foam. Categories: Designer Notes | Tags: gaming | Permalink.